Sorrento is a magical place to enjoy the 2012 Christmas. The lights shining in the typical alleyways of the city and the Christmas tree in the main square, Piazza Tasso, creates a very special atmosphere. Boutiques and shops with bright lights and handicraft defines the christmas holidays, and helps you to find souvenirs and gifts for your loved ones. Walking through the city you can taste the typical christmas food, to remain in the spirit of Christmas. Not only the light plays gives more beauty to the city, but the sacredness of Sorrento too, in fact a lot of creches are exhibited in churces and a special “live” nativty scene is part of local tradition, with people in costume playing the characters of the nativity. Events, shows, concerts and art exhibition are even more in Christmas time, making more interesting and exciting your stay in Sorrento, through art, culture and tradition. You’re goin’ to have some beautiful days for you and your loved ones. 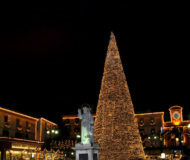 Description: Pass your 2012 Christmas in Sorrento: shops, events, art and cultural exhibition.